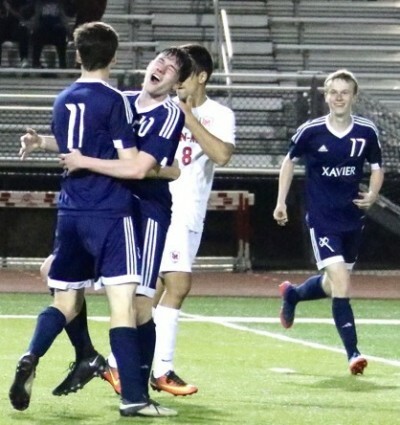 The Xavier boys soccer team was short-handed Tuesday night with two of its top players unable to play against Linn-Mar, but there was nothing short-handed about their spirit and determination. 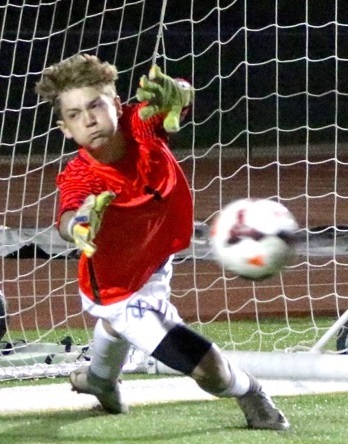 The Saints fell to the Lions, 2-1, in a marathon PK shootout that took nine players to decide at Linn-Mar Stadium. Xavier is ranked No. 2 in Class 2A and Linn-Mar is ranked No. 16 in Class 3A, but there wasn't much difference between the two Mississippi Valley Conference powers on a drizzly night in Marion. Thomas Bean, who leads the Saints in scoring, had to serve a one-game suspension after receiving a red card in Xavier's last match against Cedar Rapids Washington when he said something to a friend on the Washington team that apparently was misinterpreted by an official. Will Hannigan, the No. 3 scorer for the Saints, missed the match with an injury suffered last week against Iowa City West, taking another top player off the field. The Saints simply shuffled a few players around and came within a whisker of winning the match. "We stretched as much as we could in the game," said Xaiver Coach Amir Hadzic. "We had as many open looks as Linn-Mar had. Too bad those shots - Luke's particularly - didn't go in. That's a hard deal." Luke Duball blasted a shot from the right side that struck the left goal post and bounced away with 2 1/2 minutes left in the first overtime. If that shot had been a few inches to the right, the Saints would have claimed a 2-1 victory. Neither team scored in the first half, thanks to magnificent goal-keeping by Owen McCarron of Xavier and senior Cody Ritter of Linn-Mar. Danny Peak gave the Lions a 1-0 lead with 25:58 left in the second half when he scored on a rebound after McCarron had blocked his header in front of the goal mouth. It stayed that way until the Saints responded with an unusual goal with 6:51 left in the second half. Carter Ives began the play with a free kick from the 41-yard line and somehow the ball hit Matthew Been in the back and rolled into the net for a 1-1 tie. Neither club scored in the first overtime or the second overtime, so it went to a dramatic PK Shootout that went on and on into the night. Linn-Mar went first in the shootout and got goals from Jakob Wesselink, Peak, Alex Davenport and Brandon Raus, but Xavier responded with goals by Duball, Luke Lesnik, Nicholas Koechner and Ives. Both teams missed four shots along the way and the PK was tied, 4-4, after eight players had fired from 12 yards away for both teams. The Saints had four chances to win in the shootout after Linn-Mar failed to connect, but could not get it done. Tanner Wong, the ninth man for Linn-Mar in the Shootout, connected to give the Lions a 5-4 lead. The Saints could not respond as a shot by Nicholas Recker hit the right goal post and bounced away. "Too bad it went to PKs," said Hadzic. "That's not a good way to settle a soccer game. It's like shooting free throws in basketball after the match." McCarron, just a freshman, made some spectacular saves for Xavier. "This kid is something special," said Hadzic. "He's extremely athletic, he's been playing year-long soccer since he was 6 or 7 years old. He plays at the highest level in the Olympic Development Program. "Maybe his size is not the most impressive part of his game, but his heart and determination and technique and everything else were on display tonight. "It was just amazing," said Hadzic. "A couple of saves he made in front of the goal were just mind-boggling for me, and I've been in soccer for a long time." The Saints, who own victories over No. 9 Iowa City West and No. 10 Cedar Rapids Washington, suffered their first loss and fell to 3-1. The Lions, who have played a string of ranked teams all season, squared their record at 4-4.